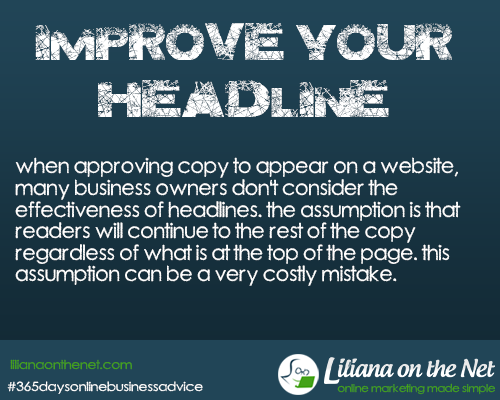 When approving a copy to appear on a website, many business owners don’t consider the effectiveness of headlines. The assumption is that readers will continue to the rest of the copy regardless of what is at the top of the page. This assumption can be a very costly mistake. Remember the old saying “Curiosity killed the cat”. Let’s face it, we are curious as well and the best way to attract curiosity is by headlines. Ideally, your headline will represent your product and advertise it at the same time, as headlines are rife with the potential to sell your product before readers even begin reading your copy’s body. It doesn’t matter what type of website you have…an online store, a content site or sales letter…you need a headline! You only have a few seconds to grab your visitor’s attention. Do it right away with a headline or it might be too late. People feel great when their unique niche is recognized. Therefore, know your audience before writing the headline. When the reader feels that you know them, they will read on. Add specific figures instead of generalizations. Make sure that you include a benefit (s) that will make your reader want more. Example: A writing service could have the following headline: What Would you do with 520 extra hours this year? View other sites and headlines and see what grabs your attention. I started a spreadsheet with the best headlines that I come across with a small explanation of what they are selling. They offer solutions to problems by giving news of the solution product. Example: Whiten your teeth in just 15 days or Money Back Guarantee! This type of headline uses testimonials for effect. What better than your satisfied customers selling the product for you? Example: I earn a lot by just purchasing this blogging course. Example: Have you turned your first business venture into a disaster? Example: Stop Wasting Time Procrastinating! Example: Easy and Fun ways of earning your first $500 online. Headlines 1 to 7 will grab my attention if they answer a specific problem or technique I am looking for. Headline 8 will only grab my attention if the reason is credible. I did buy in the past the: Buy this and you will make $10,000 per week…… Well they don’t work. I much prefer to buy something that teaches you a technique to add to your Online Marketing arsenal. The website statistics provided by your web host. Services like Google Analytics that give you detailed data about your visitors behavior. Try click tracking services like Your Ad Tracker or your own shopping cart may include some click tracking. How many visitors you have in a given month, particular day, etc. Which days and times are most popular. Where your visitors are coming from. How long they are staying on your site. How many pages they view before leaving. Whether or not they’re coming back. How many new and repeat visitors you’re receiving. Which keyphrases they are entering into search engines to find your site. Which pages are most popular. Which products they spend the most time on. Which pages they enter from most frequently. Which pages they exit from your site most frequently. Geographic location of your visitors. Which operating systems and web browsers they are using to access your website. Which links they are clicking. Knowing which pages are most popular allows you to maximize your selling opportunities on these pages. Knowing where your visitors are leaving your website allows you to plug any possible links (of course, if they’re leaving to click an Adsense ad or visit an affiliate site, that’s a good thing). Knowing where on a page the majority of your visitors are drawn to, you can readjust and maximize your results. Knowing how long visitors view a page can help you analyze the effectiveness of the page itself. Which links are being clicked on can tell you what offers your visitors are interested in and gives you a chance to test different approaches to making offers. 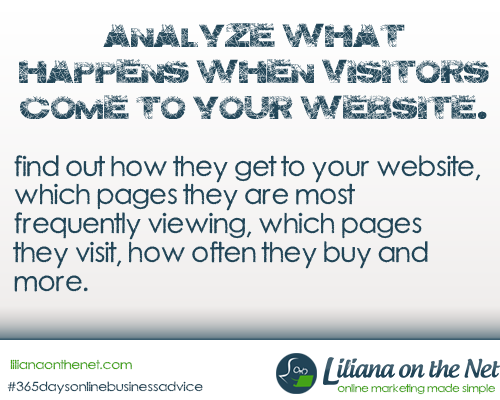 …and the opportunities are endless from what you discover when you start to analyse website visitors. Slow websites are the most frequent complaints from web users. If you suspect you are losing visitors due to your website performance you should visit THIS ONE it is an excellent resource for optimization. Until you learn all what the suggestions mean just read the top result. It compares your website with others as regards speed. Hits are requests made for files, for example you could have 10 different files in your home page: graphics, Java Scripts, videos etc; visitors to your home page will register automatically as ten hits. So you could have ten hits with just one visitor to your homepage. Hits are a very unreliable way to measure your traffic and traffic progress. You should be concerned about the number of visitors to your site. Identify your target market and find prices that appeal to them. 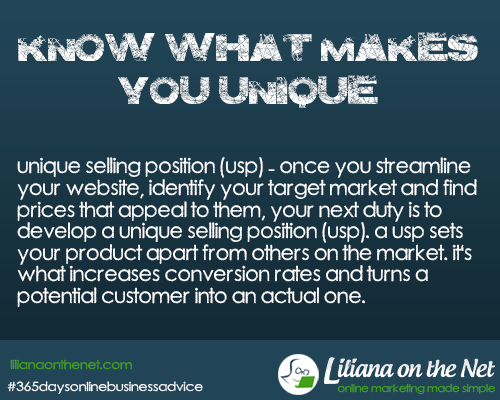 Develop a unique selling position (USP). What is an Unique Sales Position: USP? It is what sets your product apart. It is what turns a potential customer into an actual one. It is what increases conversion rates. What are the unique aspects of my product vs my competition? Which of these aspects are most important to customers? Which aspects are difficult for my competition to copy? Which aspects are easily put in fewer words? Can I create a memorable message from these aspects? Can I communicate this message? Fresh, not frozen, processed, etc. It is a great USP as it incorporates two great benefits: if you are a customer you will receive free and quick delivery! Incorporate it into your website message. Your USP is the mantra that sells your website and your products. It should answer the question that every consumer asks: “What’s in it for me”? I also expanded it in my Mission statement by saying that I am on a mission to help newbies to avoid the information overload I have experienced. It doesn’t matter if you are a big corporation or just one man business, or somehow in between you need a marketing plan. A marketing plan, for online business, needs just to list the strategies that you will implement during the period in question. It doesn’t have to be a long thought out process. Something quick and simple will do. 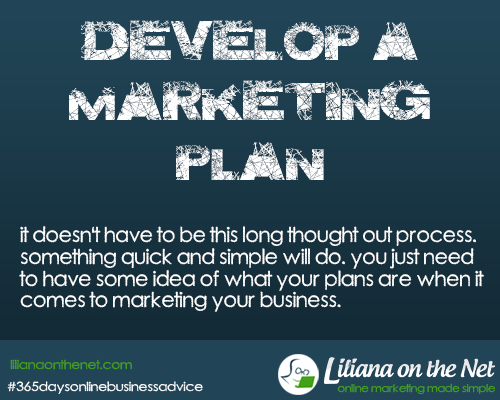 You just need to have some idea of what your plans are when it comes to marketing your business. EasyHCGWeightLoss.com: I will post daily health tip based on a series of videos, a blog post, a video on YouTube, a tweet and in my Google + Page. I will publish a Kindle eBook for the Weight Loss blog. I will enter Ultimate Blog Challenge for both blogs and will comment on 4 (2 for each of my own blogs) blogs. I will record my adventures on a Traffic category on this blog. I will comment on two blogs from the Partnership to Success Course. That’s is my draft yearly plan and finalised plan for January and February. Please also note that for January and February I am using free ways of driving traffic. Traffic methods are normally classified as free and paid, but in reality both are paid methods as the “free” takes time (a valuable resource). What type of analysis will your marketing be subjected to? What is the return on investment that you expect and how are you going to monitor it? What is your annual internet marketing budget and how will this be divided among the various marketing strategies that you have selected? Timelines are equally important because they help you to set milestones. Without timelines you are in constant danger or falling behind or getting confused within your plan for Internet marketing. Keep a strict note for dates and time all projects.